Immunoprecipitation of PRAS40 from HeLa cells using PRAS40 (D23C7) XP® Rabbit mAb #2691 (lane 2). Lane 1 contains input control lysate. All lanes are probed with PRAS40 (D23C7) Rabbit mAb #2691 as the primary antibody. Secondary antibodies include Anti-rabbit IgG, HRP-linked Antibody #7074 (panel A) and Mouse Anti-rabbit IgG (Conformation Specific) (L27A9) mAb (HRP Conjugate) #5127 (panel B). Immunoprecipitation of Beclin-1 from HeLa cells using Beclin-1 (D40C5) Rabbit mAb #3495 (lane 2). Lane 1 contains input control lysate. All lanes are probed with Beclin-1 (D40C5) Rabbit mAb #3495 as the primary antibody. Secondary antibodies include Anti-rabbit IgG, HRP-linked Antibody #7074 (panel A) and Mouse Anti-rabbit IgG (Conformation Specific) (L27A9) mAb (HRP Conjugate) #5127 (panel B). 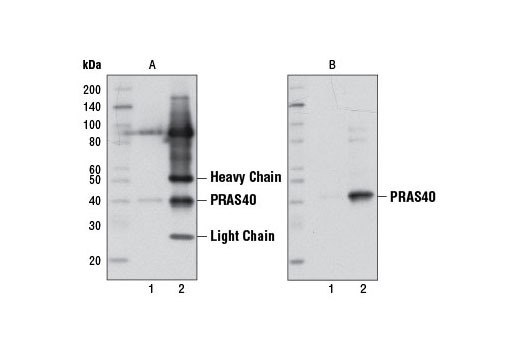 Affinity purified mouse anti-rabbit IgG (Conformation Specific) HRP Conjugate antibody. Mouse Anti-rabbit IgG (Conformation Specific) (L27A9) mAb (HRP Conjugate) recognizes the native rabbit IgG. It does not recognize the denatured and reduced rabbit IgG heavy (about 50 kDa) or light (about 25 kDa) chains on western blot. Mouse Anti-Rabbit IgG (Conformation Specific) (L27A9) mAb only reacts with native IgG and does not bind to the denatured and reduced rabbit IgG heavy chain or light chain. 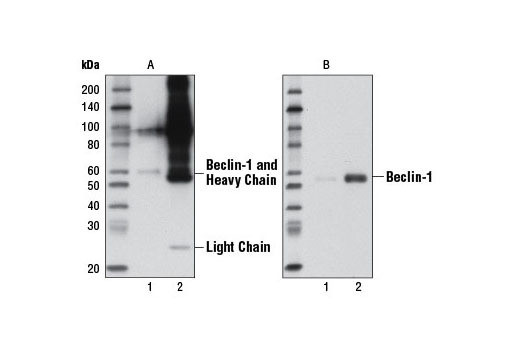 When performing immunopreciptiation (IP) followed by western blotting, the denatured rabbit IgG light and heavy chains of the primary antibody used for IP run at approximately 25 and 50 kD, respectively, on the subsequent western blot and can often obscure bands of proteins that have similar molecular weights. Using Mouse Anti-Rabbit IgG (Conformation Specific) (L27A9) mAb as a secondary antibody will eliminate this problem.